As part of the profession I’ve carved out for myself, I get to haul my bike around adventure destinations and shoot photos along the way. Of course my bike is my pride and joy and I have it spec’d just how I like it. The only problem with that is ‘how I like it‘ means it’s adorned with a lot of pricey kit. It’s funny how today’s trail bikes can deal with damn good drubbing trailside but are actually pretty fragile when it comes to hauling them about. In my experiences over the last few years -in Morocco, Argentina, New Zealand and most recently Nepal to name a few- I’ve learnt a lot about what you can do to make sure your bike gets to B from A in some kind of working order and how you and bike can survive in one piece. Well, two pieces I suppose. 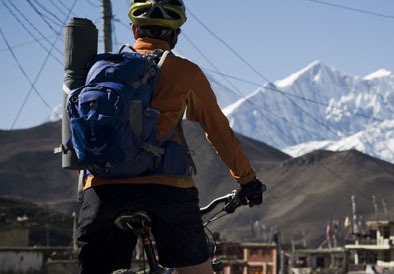 Usually my adventure trips in remote locations involve lugging the bike by any one of a dozen possible different means.. on taxi or bus roofs (with or without roof racks), bus cargo holds, plane holds (anything from 20 seaters to 747’s), hitched rides in pick up trucks… the list goes on. Most of these are essentially the only option for covering ground in “developing countries”. So here’s my top ten essentials for surviving the adventure biking challenge: and riding beautiful remote singletrack with wheels that actually still go around. 1. A good bike bag. If you’re starting and finishing in the same place, then you’ll always find a budget hotel to store your bag while you’re out and about. I just used the Polaris Bike Pod, which with the right packing has been the best bag I’ve tried to date. 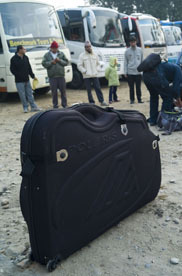 At 6Kg its way light enough not to eat into your luggage allowance and its semi-hard outer has withstood the knocks of a month of Nepalese bag hauling. Big enough for a decent full susser (eg,Yeti 575) yet small enough to get in the back of a very small suzuki taxi. Nice. 2. Cheap foam sleeping mat. 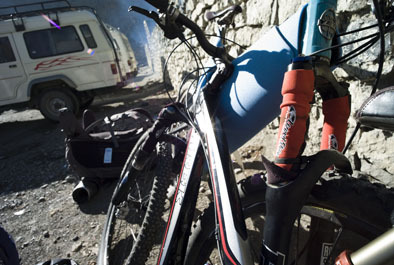 Pad out your bike in the bike bag, and then take it with you on rides. It weighs nothing and is the essential portable packing for protecting your bike’s frame when they’re carried on the bus or jeep roof. Stick one between the bikes when they’re laid on top of each other (take the pedals off too for this). 3. Ditch the lock on grips. Rubber ended grips like the Yeti logo grips give a good rubber end to your handlebars. This helps avoid damaging metal roofs of taxis (you dont want to p*ss off a taxi driver in morocco), and generally helps avoid damage to other bikes when they’re stacked. 4. Centre lock disc brakes. Discs are great on bikes, but they are a pain in the *rse when you’re hauling your bike on buses and jeeps. A bent disc stops play, simple. So you’ll often need to whip them off before you pass your bike up to the lad on the bus or jeep roof so eager to put a 56 lb sack of potatoes on top of them. 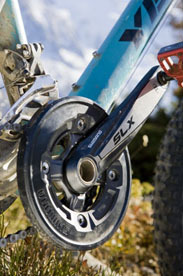 Centre lock discs are fast to take off and put on, at least way faster than 6-bolt. strip off your layers to protect your pride and joy. 5. Drybags. So the Mustang region of Nepal doesnt get any rain, but it has rivers. Lots of them. Often bridges over rivers in places like this are temporary, seasonal affairs, and can be a challenge to negotiate in themselves. The knowledge that your camera and passport are safe and DRY inside your day pack goes a long way when you’re teetering over a wobbly bridge or wading through a river, feet numb from the icy water and about to take a swim. Try Sea to Summit. 6. Fleeces and jackets. 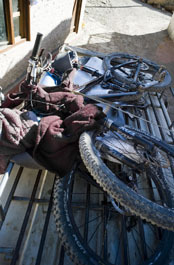 Even with your foam mat padding out your bikes frame, other extremities like handlebars, gear shifters or fork legs inevitably end up resting against the solid, component-chewing metal bar of the roof rack. Tie your bike down and then knot any fleeces or jackets around the part of the bike and wedge the material firmly between metal and component. You’ll get a very dusty fleece, but at least your carbon bars will still be one piece. 7. Water filter. The developing world’s tourist spots are becoming buried under mountains of plastic bottles. Without recycling facilities this is a real problem. Taking your own water filter, such as those by Katadyn makes any tap water safe to drink. Pump it straight into your pack’s reservoir. 8. Luggage straps. 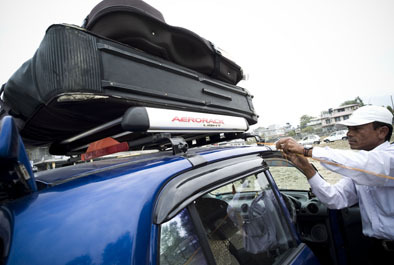 Hard to believe but taxis in many countries dont have suitable rope to tie your bike onto the roof. Carry your own web lock-down straps (and even a couple old toe-straps) and you’ve got it dialled, worry free. 9. Double chainset with bash-guard. OK, so it might not be the component of choice for the cycle tourist hitting the Karakoram Highway, but if you’re heading somewhere to only ride singletrack, then consider an all-mountain style double chainset with bash-guard. Whatever happens and however your bike is transported, your chainring will still be round. (On one trip, the big chainring on a regular triple got bent to 90 degrees, and that was while it was still inside a padded bike bag). 10. Protect your forks. Oversize chainstay protectors such as from Lizard Skins can be velcro’d on and off your for stanchions in a jiffy.. the one bit of the bike you REALLY don’t want to scratch. Carry ’em in your day pack for any jeep-transport eventuality that may come up. 11. Legwarmers. Lycra leg warmers are not just for the roadies. They make a perfect packable layer for warding off the morning cold of the mountains, while leaving you to enjoy bare legged freedom when the subtropical sun returns mid morning. Try Endura. 12. Hanger. A replacement rear-mech hanger almost goes without saying. Impossible to find in any remote corner of the globe, although Sonorom’s shop, Dawn to Dusk in Kathmandu did have a supply of replacement hangers for all sorts of bikes, and all of them milled out of brass billet by Sonorom himself.